In 2-quart saucepan, place eggs in single layer. Add enough water to cover eggs by 1 inch. Heat to boiling. Immediately remove from heat; cover and let stand 15 minutes. Drain; rinse with cold water. Place eggs in ice water; let stand 10 minutes. Meanwhile, cook bacon until crisp. Drain on paper towels; crumble. Set aside. Cook peas as directed on package. Drain peas; set aside. In 2-quart saucepan, melt butter over medium heat. Add onion; cook about 3 minutes or until tender. Stir in flour; cook until bubbly, stirring constantly. Gradually add milk, stirring constantly until mixture boils and thickens, about 2 minutes. Add cheese; stir until melted. Peel eggs; coarsely chop. 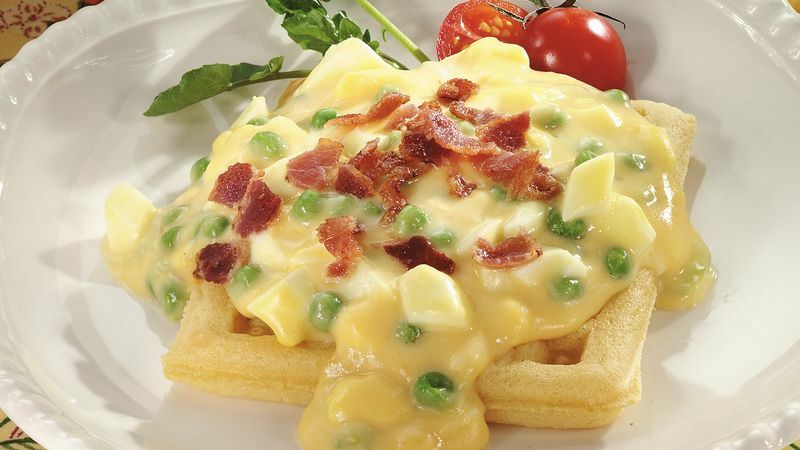 Add eggs and peas to cheese sauce; cook 1 to 2 minutes or until hot. Toast waffles as directed on package. Place 1 waffle on each individual serving plate. Top with egg mixture. Sprinkle with crumbled bacon. Serve immediately.